Three new #KwentongJollibee2018 Series videos tug at your heart and remind us of the power of love. “Homecoming” raked in 7.7M views, “Signs” 14.9M, and “Status” 7.7M. In an exclusive screening of the viral videos at the Ayala Malls The 30th, attended by the media, the cast and crew of each video shared insights and hugot lines that inspired them to bring their stories to light. You can watch all three videos below. 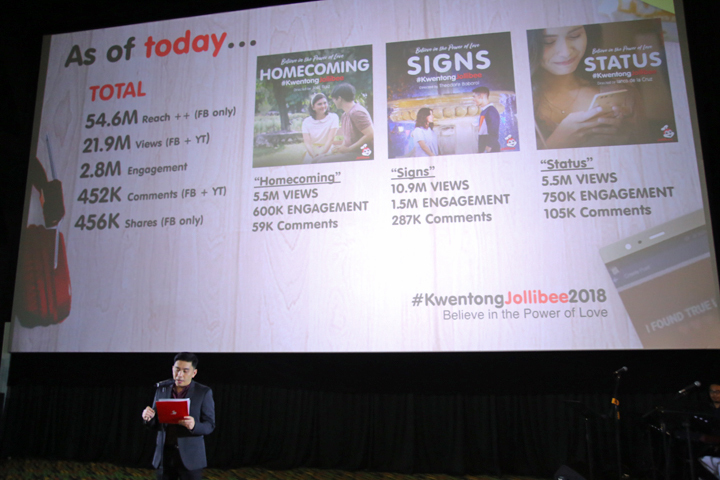 “This year, the Valentine series returns with episodes that celebrate the power of love in different ways,” shares Jollibee Global Brand Chief Marketing Officer and PH Marketing Head Francis Flores. “Homecoming”, directed by Joel Ruiz, tells the story of Gilbert and Ruth, and proves how never giving up can lead to a lifetime of bliss and love. “Signs” explores the life of Star, a hopeless romantic who believes that signs will help her find her true love. Directed by blockbuster movie director Ted Boborol. “Status”, directed by Ianco dela Cruz, follows Kat and her journey to realization that the true love she was looking for has been with her family all along. Check out more Jollibee videos on YouTube and on Facebook.